Walking around the newly renovated Indooroopilly Shoppingtown in Brisbane’s western suburbs recently, I was struck by how many high-end clothing and jewellery stores there now are in the centre. Partly this would be because high-end shops would be more likely to earn enough to afford the rent and also to cover the wages of staff, while lower margin businesses are struggling in today’s highly competitive retail environment, in which big box stores and online retailing are growing strongly. The key issues are higher minimum wages, as well as factors such as penalty rates, the lack of flexibility under the industrial relations system and level of superannuation. ABS and industry data reported by the Commission suggests labour costs account for 40-50% of the costs of retail trade businesses. Given the importance of labour costs to the retail sector, and other sectors as well, I’m surprised MacroBusiness featured an article yesterday on Why the minimum wage is good for business. This runs counter to economic theory, the views of industry (which admittedly may be biased) and the recent Productivity Commission report. I’m unconvinced by the argument in the article that, because there are other countries with lower minimum wages and higher unemployment, minimum wages don’t affect employment. To reach any conclusion based on cross-country data, you would need to control for a wide range of differences in the economies, taking into account the fact that many OECD economies have had weak economic conditions ever since the financial crisis. I’d note the Federal Government is doing its best to encourage young people to earn or learn, but I’m worried that Australia’s relatively high minimum wage and other regulations, such as restricted trading hours, are limiting opportunities for young people, particularly in retail, which is traditionally a big employer of young people. 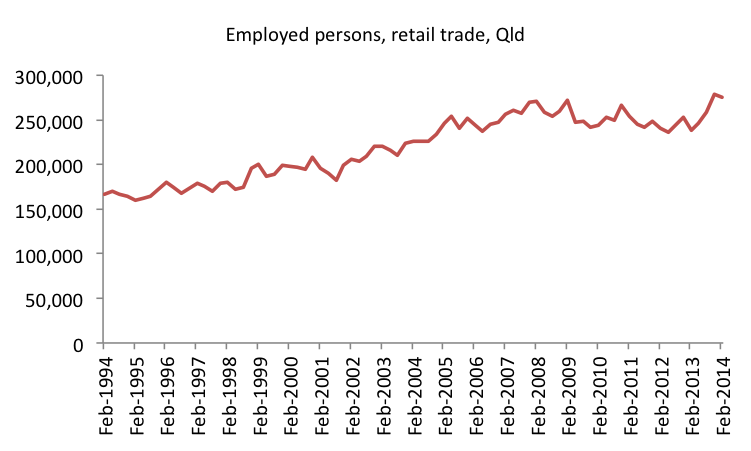 The ABS data show employment in retail trade has been relatively flat in recent years (see Chart below). With the recent Productivity Commission report highlighting the huge significance of labour costs to the retail sector, IR reform should once again become a priority. This entry was posted in Labour market, Retail trade and tagged australia, minimumwage, pc, productivitycommission, retailtrade. Bookmark the permalink.